Galaxy Tab | The Small Wave. The above is from presiding Judge Johanna Brueckner-Hofman in her verdict. Forget whether you think the tech world is lawsuit-happy. Forget whether you think this is a bad decision. Forget whether you think this is just Germany, and no other country will rule this way. Forget your Apple hate or Samsung/Android love. Forget all that. Instead, remember the above quote. 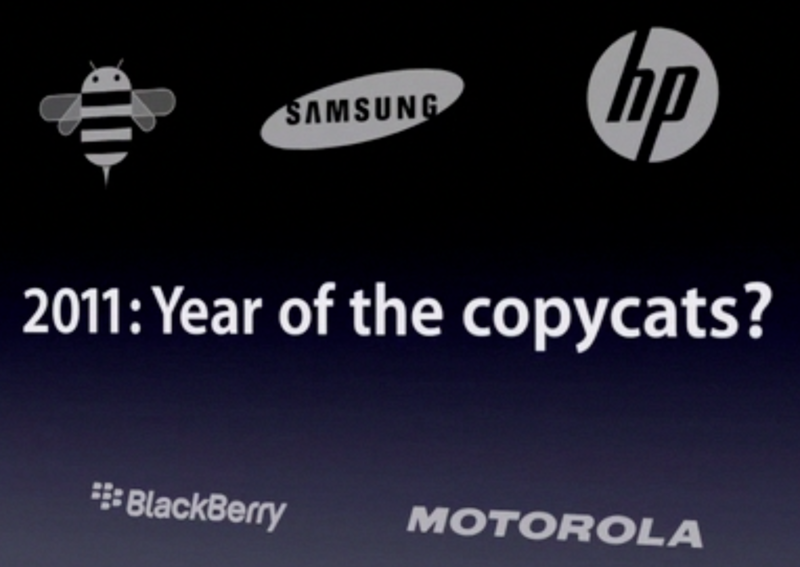 It gets old seeing companies copy Apple so fully, and then claim they had no choice because there’s no other way to make whatever it is they’re making. Of course there is. We’re not talking a single function like a volume switch or camera button, but rather an entire product. If Apple used that lazy cop-out, the iPad would have been built like previous Windows tablet designs and failed miserably. What Apple did was rethink what a tablet could be, and so could anyone else if they choose. It may then be a success or failure, but it wouldn’t be a copy. Next up, Chevy issues Ford vehicle recalls. The chart totals over 100% because respondents were allowed multiple choices. That’s too bad because it skews things a bit. Yes, the iPad is stomping everyone, but 94.5% has less meaning when the total comes to nearly 150%. It’s better to look at this one column at a time, where we can determine a device’s absolute rejection (not acceptance). For example, we don’t know that 3.8% of respondents would buy a RIM PlayBook, because it may have been their second choice, but we do know 96.2% of respondents rejected it outright, since it’s not on their list at all. I think of the beatdown like this: for each iPad competitor (column), 90% or more of respondents rejected it. In other words, nine out of 10 people wouldn’t even put it on their list as a second choice. Meanwhile, the iPad is rejected only 5.5% of the time. Put it all together and we know not only that the vast majority of respondents are interested in the iPad, but that for most of them there is no Plan B. According to one source who’s seen internal HP reports, Best Buy has taken delivery of 270,000 TouchPads and has so far managed to sell only 25,000, or less than 10 percent of the units in its inventory. New estimates for sales of Motorola’s Xoom tablet–available since late February–are in, but even the most optimistic predictions are scarily small and pale next to the iPad 2’s first-weekend sales numbers.